"41MR12, Burial I, 72" by Timothy K. Perttula and Robert Z. Selden Jr. VESSEL FORM: Carinated bowl with a direct rim and a rounded, exterior folded lip. There are four small rim peaks on the vessel. DECORATION: The engraving on the rim consists of interlocking scrolls repeated four times across the rim. The central scroll line has small tick marks on it. Above and below each scroll are triangular-shaped areas with hatched engraved lines. A red pigment has been rubbed into the engraved lines. 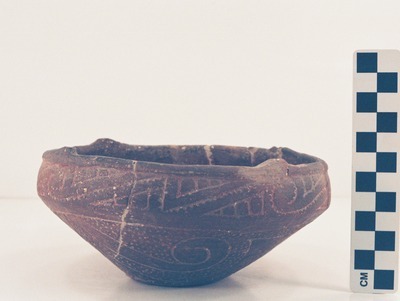 The carinated bowl body is also decorated. The base has an engraved circle around its edges with four pendant triangles; there are small dots or punctates within each of the pendant triangles. On the vessel body, there are four scroll-shaped zones filled with small tool punctations, and these punctate-filled scroll zones are either attached to or wrapped around a small engraved scroll with a hooked arm. Taylor Engraved vessel (MR12-72) from Burial I at the Ben McKinney site: a, side view; b, bottom view.